AFRICANGLOBE – It was one of the most difficult scenes in Spike Lee’s classic movie “Do the Right Thing,” the brutal strangulation of peace-loving Radio Raheem by New York City police in a Brooklyn pizza shop. That scene touched a raw nerve as it recalled the 1983 death of 25-year-old graffiti artist Michael Stewart, another choke-hold victim of the New York City Police Department. 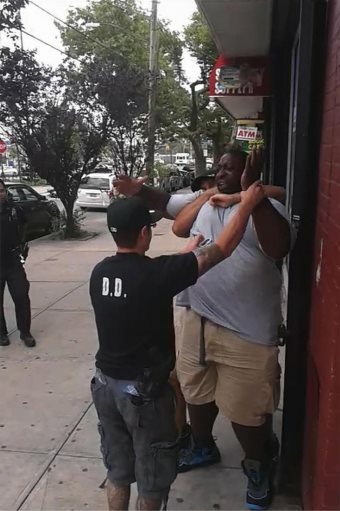 Now, we find ourselves enraged over the police killing of Eric Garner in Staten Island, which was captured on cell phone video as a police officer puts him in a choke hold, with the man pleading that he can’t breathe. Garner was taken away unconscious and later pronounced dead. Another day in America. NYPD Chief Bill Bratton’s order that all officers undergo training on the proper techniques to apprehend suspects is too little in light of the brutality of Eric Garner’s death. For starters, every officer on the scene should be dismissed. If officers sworn to uphold the law can witness a citizen being choked to death and not intervene, they are not capable of fulfilling their legal duty to protect and serve. The video clip clearly shows a man who was not confrontational, who was attempting to defuse the situation and was trying to communicate with the officers. He is taken down by the officers and then thrown to the ground as an officer puts him in a deadly choke hold. Garner can be heard on the video pleading “I can’t breathe,” but his physical condition was of little concern to the officers who were intent on demonstrating that they were the dominant force. Eric Garner was lynched.